V-Mart Retail is in fashion retail in mid to small towns (Tier 2 and Tier 3 cities). It has expansion in 2016. We have 136 stores across 116 cities in 14 states and union territories,with a total retail area of 11.48 Lac sq.ft (106694.21 Thousand Sq Mtr.). Our stores are located in prime states/cities such as Bihar, Chandigarh, Gujarat, Haryana, Jammu and Kashmir, Madhya Pradesh, New Delhi, Punjab, Rajasthan, Uttarakhand and Uttar Pradesh. We are among the pioneers in setting up modern ambiance stores or large retail malls across various small towns and cities like including Sultanpur, Ujjain, Motihari and more. Shares in the hand of public are not big. Biggies has cornered big part in Sept, 2016. Footfall: 113 Lakh in Apr-Sept, 2017 Vs 98 Lakh in Apr-Sept, 2016. Stores has grown but sales growth has not happened according to the growth in stores. I think new stores would take time to give return but manpower cost etc has taken dent on profit. In festival season of Oct, these may have given good sales. 62% of total stores are in Bihar and UP. So, are both states going to do well! In Odisha store count is 10 and in Jharkhand 7. 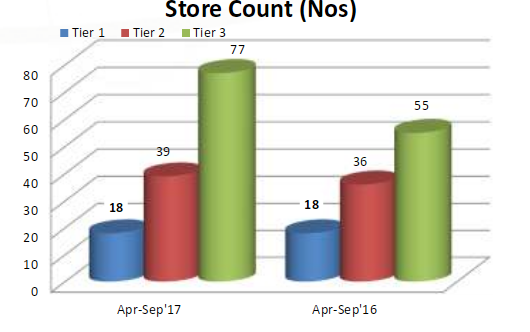 The Store count is out of 134 stores as of Sept, 2016. How election affect fashion? It promotes buying or not! This effect, if any, can be for 1-2 months in Uttar Pradesh. Eight new stores in July and Sept, 2016. Agra, Jammu, 3 in Odisha, one in Varanashi and two in West Bengal. Long term price average in not far. It has not gained in past one year. Profit is down. Sales growth has happened but this year should be good on new pay commission and better farming output. Demonetization can affect it's Dec sales but that could be a time to load more shares.